How do you measure the safety of a road tunnel? Road tunnels are an important part of the infrastructure network. This is understandable since these underground passages allow for the reduction of travel time, and sometimes the reunification of separated communities. Building tunnels is an engineering challenge that requires state of the art expertise. Dr. Johan Lundin, Technical Director Risk, at WSP | Parsons Brinckerhoff in Sweden recently presented his work at the International Symposium on Tunnel Safety and Security (ISTSS ) in Montreal with Jan Malmtorp, from the Swedish Transport Administration. His presentation can be summed up in one question: How do you assess and evaluate the safety of a road tunnel? Knowledge of how to analyze risk in tunnels has developed substantially during the last ten to fifteen years, and there are minimum safety requirements to follow around the world. In Europe for example, more than 1300 kilometers of main road tunnels need to be upgraded by 2019 to meet higher safety standards. But it won't be easy. But how do you go about determining that a tunnel is safe enough? How do you determine the amount of risk that is acceptable? These difficult questions are at the heart of risk assessment. 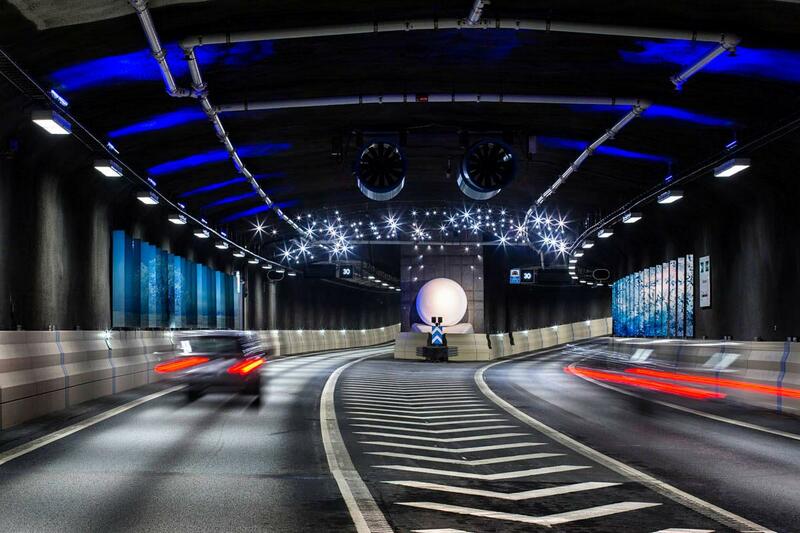 They are also the basis for policy-making, and it is with that in mind that the Swedish Transport Administration and WSP | Parsons Brinckerhoff worked together on safety target proposals for road tunnels that match those of surface roads. “Ultimately, we want to be able to say that roads and tunnels are equally safe,” said Per Vedin, tunnel safety specialist with the Swedish Transport Agency, also present at the conference in Montreal. What Safety Levels are Acceptable? First, Johan Lundin’s team set out to review road data of the last ten years in order to have a comprehensive view of the situation. The number of vehicle accidents was compared with the number of vehicle-kilometres travelled during the time-period on the surface roads of Sweden. That gave an acceptable average risk on roads in terms of expected number of vehicle accidents and fatalities per vehicle-kilometres. A risk profile was created showing the frequency and consequences of accidents. The team was then able to establish that vehicle accidents in road tunnels, when they do occur, have more serious consequences than surface road accidents which means that road tunnels have greater risks than surface roads. To equalize the risk in road tunnels with the level of surface roads, as stated by Per Vedin, you need to either reduce the frequency of accidents in tunnels or minimize their consequences, or both. Frequency relates to prevention while consequences have to do with reactions. How much money should be invested in trying to control risk to make the expense worthwhile? Where will the investment make a real difference in safety levels - in preventive or in reactive measures? Johan Lundin’s team found that in order to achieve the same safety levels in road tunnels as on surface roads, it is necessary to try to reduce the frequency of less serious accidents. “Accidents don’t happen by magic. You need an initiating event and it is possible to do more in road tunnels to prevent accidents from happening,” says Dr. Lundin. The objective is thus to reduce the probability of initiating events (reduce accident probability or frequency) through different tools and methods, such as reducing speed limits, installing surveillance cameras, designing lanes for traffic control, introducing better lighting, etc. Once you worked on this aspect, you focus on reducing the consequences of accidents. Here, the objective is to make sure that mitigation efforts are effective. For example, the ventilation system must be adequate in regards to the size of the tunnel and the traffic volume. WSP | Parsons Brinckerhoff is specialized in tunnel safety and tunnel ventilation. By combining our experience in analysis, design, and asset appraisals, we reduce whole life costs and risks, and improve sustainability. The risk assessment data can show where the risk is deemed acceptable after adding cost-effective measures that further reduce the frequency. The cost effectiveness of the various measures will need to be evaluated before neglecting them. Since roads (and road tunnels) don’t have the same number of cars travelling, using a safety target based on vehicle-kilometres allows the target to be adjusted according to both traffic intensity and the length of the tunnel. However, coming up with methods and principles on how to address such issues, and present the basis for such a decision is an important step forward.